Despite major breakthroughs in ophthalmology, there is no denying that visual impairment keeps gaining ground and that the consequences of rare genetic congenital illnesses or commonplace pathologies due to age highlight the limits of this science. Most visual impairments are due to damage to the retina, and in particular to Age-Related Macular Degeneration (AMD), glaucoma, diabetic retinopathy and retinal dystrophy. These affections are a major, if insufficiently recognized, source of handicaps, which are all the more difficult to accept considering how society gives visual communication such a predominant role. This project, which was supported from its inception by INSERM, The Pierre and Marie Curie University and the Quinze-Vingts National Hospital Center of Ophthalmology (CHNO), was born out of the will to overcome these therapeutic limitations by creating a research center totally devoted to the biology of the visual system and ocular pathologies. This project, called the Vision Institute, relies on public and private partnerships. It was created in just a few years thanks to an innovative financing model and to the tenacity of its founder Pr. José-Alain Sahel, doctor, researcher and renowned specialist of the retina, assisted by a team of motivated collaborators. The building spans 6000m2 and has been open to research teams since March 2008. 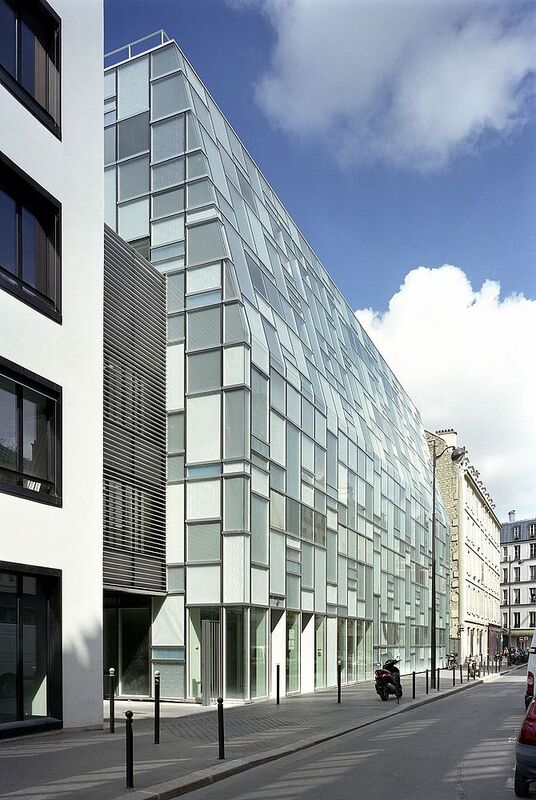 It has been inaugurated on December 11th at the Quinze-Vingts National Hospital Center of Ophthalmology (Paris), one of the most prominent ophthalmology hospitals in Europe. The Institute has great ambitions: become an elite center of international acclaim, hire the best researchers in the international scientific community, and finally associate durably the industrialists of the field, without whom there can be no practical implementation of developed innovations. Its goal is to discover, test and develop the treatments and technological innovations of tomorrow in order to prevent or limit visual impairment and better the autonomy and daily quality of life of patients. The Vision Institute harbors, aside from the research center, a clinical investigation center, a rare disease reference center and innovative new companies. They develop their activities in the legal framework of the “Voir & Entendre” Foundation. The teams of researchers (a dozen) were identified and selected through the unit INSERM 592 after considering the pertinence and quality of their works, and through international invitations to tender under the supervision of an international jury. This approach made it possible to draw young upcoming talents in the field. The Institute also offers Chairs of Excellence, financed by the National Agency for Research (ANR), the first of which have been offered to esteemed scientists such as Pr Bhattacharya, from the Institute of Ophthalmology of London, pioneer of ophthalmologic genetics; and Pr. Don Zack, from John Hopkins University in the United States, specialist of the glaucoma. The scientists are already at work on several aspects of vision, inside four different divisions: biology of development, genetic, treatment of visual information, and finally, therapeutic innovation. The researchers have at their disposal high tech platforms, the quality of which is an important factor of attractivity. In time, the creation of a biological resource center is planned. Its purpose will be to stock and administer tissue samples, cells and DNA from patients. Several research projects look very promising already, such as the Brainbow technique to visualize the neuronal network in multicolored hews, the use of a cone survival protein, the RdCVF, in the treatment of pigmentary retinopathies, genetic therapy treatment of the Leber neuropathy, and also the creation of an artificial retina. In 2005 the Center for Clinical Investigation (CIC) in ophthalmology was created de novo at the Quinze-Vingts CHNO with a technical support center unique in Europe. It will allow academics and industrialists to make clinical tests (21 studies are now in progress) on all eye pathologies, with a specific expertise on retinal and anterior eye segment pathology exploration. The CIC plays a predominant role in the setting up of therapeutic try-outs for the pharmaceutical industry. A partnership with Iris Pharma, which specializes in clinical testing for ocular diseases, makes the Vision Institute still more competitive. The CIC is a highly strategic entity, at the crossroads between fundamental research and industrial development; it has a high-level therapeutic evaluation as the first successful artificial retina transplant to occur in France, in February 2008 – one of the first such transplants in Europe – shows. Its integration at the heart of a vast European network of clinical test sites in ophthalmology is also a testimony to its excellence. The CIC will coordinate, amongst other projects, the vast EVI-GENORET project, which is dedicated to retinal genetics and regroups 60 European companies. The presence of industrialists on site is a unique occurrence in France, and one of the major elements in the dynamics of the Vision Institute. Two floors spanning over 2000m² are set aside for them, and all industries represented develop scientific collaborations, following pre-set terms of reference, in several fields: drugs, imagery, medical machinery… Industrialists have access to the whole scope of scientific resources and infrastructures (CIC, platforms…) to confirm their therapeutic innovations. The Institute attaches great importance to the development of technologies meant to better the environment and daily lives of the visually impaired, notably technologies using artificial intelligence, ergonomic and optoelectric devices. This is the mission of the Biology and Handicap division which develops several projects in partnership, such as the Descartes project, supervised by Essilor and financed by Oseo. First rank companies such as Essilor, Novartis, Servier, Allergan, Thea, Ovation, Fovea Pharma, etc. were attracted to the project thanks to the scope of the means at their disposal and have become major partners. The Institute will also house new innovative companies stemming from the promotion of its own research, or that of other European centers. More recently, the Institute for Vision was awarded several important labels which will enhance its reputation: the Carnot label, awarded by the Ministry for Research which acknowledges the quality and professionalism of its partnership programs; the “Voir & Entendre” Foundation CTRS/RTRS label, which promotes research programs, alongside INSERM, UPMC, hospitals, Pasteur Institute and patient associations (FAF); and the “Structuring Program” qualification by Medicen Paris Region which is the worldwide competitiveness center regarding state-of-the-art technology for health and new therapies. The awards are also international, since the Institute received the label of the Foundation Fighting Blindness (FFB) and Novartis, which make it one of the reference centers for therapeutic validation. The Institute has given itself numerous assets to reach its given objective – beating visual impairment. It will achieve this on the condition that the dynamic of innovation initiated hereunder receives adequate and recurring financing, which is essential to its durability. It represents a very stimulating challenge for coming years. The city of Paris, Ile de France region and state financial tools, via ANR, OSEO and competitiveness center, have supported the Institute of Vision whole-heartedly since its inception, be it with financing the operating budget or the acquisition of scientific equipment. Fovea Pharma is a start-up set-up by Pr Sahel (INSERM U592) and specializing in the development of new treatments for DMLA, glaucoma and retinitis pigmentosa. The purpose of the Carnot label is to promote partnership research, i.e. the research efforts of public laboratories in partnership with socio-economic actors, notably companies. The award of this label results in a 20% subsidy for every industrial partnership program.